It’s that time of the year again… Time for BACON CAMP! My dear friend Karen is once again working her magic to organize the second annual San Francisco Bacon Camp. I had a little trouble coming up with something to follow my award-winning entry last year, but ultimately decided to just chill out and make something that tastes good. Fortunately, my internet friend Lucky Olive posted a picture of a delicious-looking home-made pretzel and inspiration struck. I would make bacon pretzels. Baconifying the original recipe wasn’t too difficult. Chop 6 pieces of the raw bacon into roughly 1 cm square pieces. Cook in a frying pan until the pieces are crispy and delicious. Put bacon on a paper towel to drain. These pieces are to go in the dough. Reserve the fat from the pan. Cook another 2 pieces of bacon whole, this time leaving them slightly less done — they shouldn’t be crispy. Drain these pieces of bacon on paper towels, patting off excess grease. Dice them finely. Put them in a small dish and refrigerate them. These bits are to go on top of the pretzels. Again, reserve the fat from the pan. Warm the milk in a saucepan until it’s about 110°F. Make sure it’s not any warmer or the yeast will die and not work as well. I used a candy thermometer to check the temperature. Pour the milk into a mixing bowl and sprinkle in the yeast. Let the yeast soften, about 2 minutes. Stir in the brown sugar and 1 cup of the flour with a wooden spoon. Add 2 tablespoons of melted bacon fat and the bacon pieces you made in Step 1. Stir to mix well. Add the remaining 2 1/2 cups flour and the fine salt; mix well to make a sticky dough. Turn the dough out onto a lightly floured surface and knead, adding more flour if needed, until smooth but still slightly tacky, about 5 minutes. Lightly grease a bowl (I used bacon fat, of course). Shape the dough into a ball. Roll it around in the bowl to coat it in grease. Turn it over so it is crease side down, and then cover the bowl with a lightly moistened tea towel. Set it aside in a warm place to rise for an hour or so, till the dough has doubled in size. This would be a good time to make the dipping sauce (see below). When the dough is almost done rising, preheat the oven to 450°F. Grease a large baking sheet (you might need two). Punch the dough to deflate it, then turn it out onto a lightly floured surface. If the dough seems tight, cover it and let it rest until it relaxes. Divide the dough into 6 pieces. Carefully roll and stretch each piece with the palms of your hands into a long, thin rope. Form each rope into a pretzel shape. Dissolve the baking soda in 3 cups warm water in a shallow baking dish. Gently dip each pretzel in the soda solution, then arrange on the prepared baking sheet(s). Sprinkle liberally with coarse salt and the bacon bits you made in Step 2. When the pretzels are done baking, brush or drizzle them with melted bacon fat, being careful not to dislodge the bacon bits. Let them drain on a wire rack. Serve warm with dipping sauce. Whisk together the mayonnaise, mustard, maple syrup, and vinegar until they are smooth and evenly mixed. Cover and refrigerate. 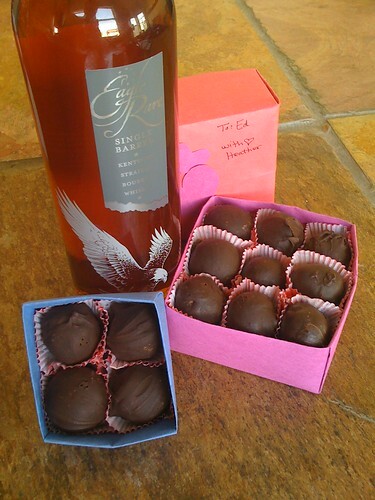 I know, I know, it’s a little late, but these rich treats are a perfect Valentine’s day gift. Bookmark this for next year! I made these for my sweetie this year. I made half of them with bacon and half of them without. Both versions are delicious, it just depends on how much you love bacon. They’re dairy free, and if you leave out the bacon they’re vegan! Cut bacon into bits and cook it in a frying pan. Allow to drain on paper towels. In a heavy saucepan, combine the soy milk and margarine over medium-low heat. Stir until the margarine melts and the soy milk simmers. Remove from heat and add 12 oz. chocolate and stir until melted and smooth. A whisk is helpful here. Pour in the bourbon and bacon bits and mix thoroughly. Pour into a bowl. Cover and freeze until just firm enough to mound in a spoon, about 40 minutes. Line the bottom of a baking sheet with aluminum foil. Scoop out the filling by tablespoonfuls, spacing them evenly. Roll them into rough balls. This will be messy, and they don’t have to be perfect-looking. Cover and return to the freezer for 30 minutes. Pour cocoa powder onto a plate. Roll chocolate balls in cocoa powder to coat evenly. Re-roll balls to even them out — the cocoa powder will help them not melt and stick to your hands. They should look more like actual spheres now. Return truffles to the foil-lined baking sheet, cover, and put in the freezer while you prepare the coating. To make the coating, melt 12 oz. of chocolate in a double boiler until it’s smooth. Remove from heat. Re-roll truffles between your palms to remove any loose cocoa. Gently drop one truffle ball into the melted chocolate coating, tilting the pan if necessary to coat the ball completely. Slip a fork under the truffle, lift it from the chocolate, and tap the fork gently against the side of the pan to allow any excess chocolate to drip off. Using a knife, gently slide the truffle off the fork onto the foil-lined baking sheet. Repeat with the remaining truffles. Refrigerate, uncovered, until firm, about 1 hour. Store in an airtight container in the refrigerator for up to 3 weeks. My friend Mazzie tipped me onto this crazy stuff. Beer bread is a quickbread, but some reaction between the beer and the flour gives the bread a texture that’s surprisingly similar to yeasted bread (which, of course, takes significantly longer to make). It has a slight sweetness to it, making it somewhat perplexing: is it savory, or is it for dessert? Well, honestly, you could have it either way. It would be great with a hearty stew. You can also put whatever you want in it. I chose to put bacon in it, but chunks of cheese would be a good choice too. Or, if you leave the bacon out, the bread becomes vegan. It takes about 5 minutes to stir together and an hour to cook. Easy peasy. Preheat oven to 375°F. Grease a loaf pan. Cut bacon into bits and cook in a frying pan. Place on paper towel to drain. Mix dry ingredients with beer. Pour batter into greased loaf pan. Pour bacon grease, butter, or margarine over the top of the batter. * According to the recipe I used, sifting is not optional. If you don’t want to sift, you can spoon the flour into the measuring cup. The goal is to avoid scooping it out of the container and leveling it off, which compacts the flour. If you do that, you’ll add too much flour and the bread will turn out brick-like. I used the spooning method and it worked fine. Let me preface this by saying: I am not from Louisiana. I have never even BEEN to Louisiana (though I’d like to go some day). The only time I’ve ever had dirty rice was at a crazy BBQ joint in Boston. I’d been briefly exposed to Cajun cooking several years ago when my friend Chrissy LeMaire over at RealCajunRecipes.com gave me tutorial when I was crashing at her house. From that, I knew that the foundation of many Cajun dishes is the indisputably delicious “Holy Trinity” of onions, bell peppers, and celery, sauteed slowly in some kind of fat. I saw that we had 2/3rds of the trinity, some some Aidells Cajun Style Andouille sausages, and rice, and was inspired to make us some dirty rice. While RealCajunRecipes.com‘s Dirty Rice recipe looks amazing, it was a bit more involved than I was prepared for. Instead, I used this recipe at cdkitchen.com as a starting point. We lacked the bacon, pork, celery, green bell peppers, chicken livers, and chives. What we did have was a whole lot of bacon grease, the aforementioned Andouille sausages (surprisingly not very spicy), celery seed, and red and yellow peppers. I’m not the biggest fan of chicken liver anyway, so I wasn’t too broken up about missing that key piece of the puzzle. Following the recipe, my own taste buds, and my knowledge of cooking, I interpreted the recipe according to our available ingredients. The result? Delicious. Prep your veggies and sausages. Mix all spices together in a small bowl. In a large saucepan over medium heat, heat bacon grease. Cook sausage pieces until slightly browned. Remove from pan with a slotted spoon, leaving the fat in the pan. Reduce heat to low. Add bell peppers, onion, and garlic and saute for 5 minutes. Add all spices and cook another 3 minutes, stirring. Stir in rice, cook another 5 minutes. I just got back from BaconCamp, which was great fun. So many great people, so many awesome bacon dishes. I had a blast passing out my ice cream and cookies to eager people. I’m presently in a bacon coma from all the delicious porky goodness I consumed. I loved Joy’s bacon blue cheese dip and Nathalie’s bacon apple pie. Rick and Burstein‘s divinely spiced home cured bacons stole my heart: I think between the two of them they brought 5 different kinds! Unfortunately I didn’t get to try Mike Perry’s chicken fried bacon, which got rave reviews and came in at a close second place– we’ve made a pact to have a dinner party where his dish is the entree and mine is the dessert. The best part was, I WON!! My Maker’s Mark ice cream with candied bacon bits and maple caramel swirl took the grand prize, with 40 votes from the audience! And the judges all liked it too: all 5’s except for one 4 because the ice cream itself didn’t taste bacony (it wasn’t supposed to). I am just tickled. I don’t know what to do with all the compliments! But I have to say, making food that people like puts a grin on my face like nothing else. Many, many thanks to Karen who organized the event but sadly couldn’t come, and to the rest of the folks that made it happen too: Diva, Juicy, Steve, Massive Bri, Cubes, Nina, Kevin, Dennis, Micah and many others who I don’t know. Thank you also to Scott at Bac’n for providing many of the prizes and also doing some of the judging, and Nermo for doing on-the-spot silk screening! Dishing out the ice cream to the judges. Why yes I did store it in margarine containers. Photo by Edrabbit. Me with all my loot. Photo by Edrabbit. I came up with the idea for this particular ice cream for this weekend’s Bacon Camp, an event put on by Karen (and…?). I wanted to make something decadent and amazing that no one had tasted ever before. I was inspired by a few sources. Kasey’s bacon-infused Maker’s Mark came to mind (so smoky! ), as did Doc Pop’s limited edition fro-yo with Cinnamon Toast Crunch, bacon bits, and maple syrup on top. I had the pleasure of having a bowl of it last week. Utterly delicious. When I got on the web to start researching how to put this recipe together, I found that I was not the first to attempt this bacon ice cream thing. The recipe to which I owe the greatest credit was David Lebovitz’s Candied Bacon Ice Cream. It even has a bit of alcohol in it, though it is less of a focus. I ran into trouble with his recipe, though. The bacon didn’t candy as I’d hoped it would. The problem was that the technique didn’t allow the fat and moisture to drain at all– American bacon has a LOT more fat than French bacon, judging from the pictures. What I got, even after cooking for an additional 10 minutes, was delicious sticky gooey floppy bacon, not crisp little bacon bits encased in hard sugar as I’d hoped. I tucked those away in the fridge for, uh, safekeeping and moved on to the next candied bacon recipe— this one posted on epicurious, care of Gourmet magazine, February 2007. I used brown sugar instead of demerara sugar, and chopped the bacon into bits before cooking them. Though it was better than the last, this recipe failed me too. I found that even after I drained the pan, the residual oil and crusty bacon stuff stuck to the bottom of the pan caused the sugar to melt unevenly and not cover the bacon very well. Ultimately, the result tasted burnt–partly, I think, because the sugar burnt slightly (being brown sugar, I couldn’t tell when it was caramelized), and partly because the bacon stuff on the bottom of the pan burned. The bacon bits also stuck together, and the candy surrounding them was slightly tacky on the tooth, rather than being crisp, like I wanted. Lastly, the bacon was overdone. Still pretty tasty, but not good enough. Armed with my newfound knowledge, I devised a plan of my own: cook the bacon bits to perfection, let them drain on paper towels. In a small, clean sauce pan, melt regular white sugar just until the sugar is dissolved. Add bacon bits and quickly coat them, then pull them out and put them on parchment paper. Third time’s the charm; it worked beautifully! Well, mostly. When the sugar cooled almost instantly as it hit the bacon, it all stuck together into a giant bacony, sugary glob. This made it difficult to get even coverage. I spent a while painstakingly separating the bits into more managable pieces. While it could have been a little better, the result was close enough: slightly crisp, slightly tender bacon bits encased in a crisp sugar shell. For the ice cream itself, I used David Lebovitz’s recipe, with a few slight alterations: I used 1/4 cup Maker’s Mark* instead of a mere 2 teaspoons, I added 1 1/2 teaspoons molasses, and I nixed the cinnamon. One very important thing I learned when making the custard was not to let the initial butter/brown sugar/half & half mixture get too hot. It will curdle and you will have to throw it away. I somehow managed to do this TWICE. Don’t let it boil, heck don’t let it bubble at all. Just warm it up. Be similarly careful you’ve added the eggs in, too. *Note: don’t be tempted to try to reduce the bourbon in an attempt to get the ice cream to freeze better. It just ruins the bourbon, which will make you very, very sad. The ice cream will freeze just fine, I promise. Lastly, I had to make the maple caramel swirl for the ice cream. I used this recipe–also from epicurious/Gourmet November 1998–and substituted maple sugar for the light corn syrup. It didn’t turn out perfectly. I believe I didn’t let the sugar/syrup/water mixture boil for long enough because I couldn’t tell when it was an appropriate “deep golden caramel” color– the color of the maple syrup threw me off. A candy thermometer would help with this, though I don’t know what temp to bring it to. I ended up adding the cream/vanilla mixture too soon, and it didn’t seize up like it said it would. I try to cook it for a long time after the cream had been added to compensate, and in the end I got a caramel that was the perfect consistency, except it was a bit grainy in texture. I’m not sure if that’s from the milk solids curdling or the maple syrup crystalizing, but it still tastes DELICIOUS (and maple syrup is expensive) so I decided to keep it. Tonight I finally put it all together. It is divine. The ice cream/caramel is ridiculous just on its own, and the bacon is wild– it totally throws me off! So salty-sweet and crunchy. Now we just have to see if the crunchiness will stick around after the bacon bits have been immersed in the ice cream for a while. Adapted in part from David Lebovitz’s Candied Bacon Ice Cream recipe, and Gourmet’s Coffee Caramel Swirl Ice Cream recipe. This is a multi-step, two day process, so be sure to allot enough time! Cut the raw bacon into 1cm squares — cutting each strip in half lengthwise, and several times crosswise. In a heavy skillet over med-high heat, cook the bacon bits until slightly crisp but still a bit chewy, being careful to not burn or overcook them. While the bacon is cooking, prepare a plate with paper towels on it to drain the bacon, and lay out a piece of parchment paper for the candied bacon. Place bacon bits on paper towel to drain; pat off excess fat. Pour off fat from pan and save it for some other tasty treat. Allow bacon bits to cool on the parchment. Remove pan from heat and carefully pour cream and vanilla down side of pan (mixture will vigorously steam and caramel will harden). Simmer mixture, stirring, until caramel is dissolved. Remove pan from heat and cool caramel. Caramel swirl may be made 1 week ahead and chilled, covered. Bring to room temp before using (heat slightly if too stiff to pour). *I added the cream too soon, so I just continued boiling the mixture until it was the correct thickness. I tested thickness by dropping a bit of it on a cool plate and letting it cool to room temp. Then I ate it. Pour half of the half-and-half (about 1 and a little more than 1/3 cup) into a large bowl and set it in an ice bath. * Set a mesh strainer over the top of the bowl. In a separate bowl, lightly whisk together 5 egg yolks. Melt 3 tablespoons butter over low heat in a heavy, medium sized saucepan. Stir in the brown sugar and the other half the half-and-half and whisk it till the brown sugar is somewhat dissolved. Heat just to warm, and keep a close eye on it. Too hot, and the half-and-half will curdle and you will have to start over. Gradually add the warm brown sugar mix to the eggs, whisking constantly as you pour. Pour the entire mixture back into the sauce pan. Cook over low to moderate heat, constantly stirring and scraping the bottom with a heatproof spatula, until the custard thickens enough to coat the spatula. Strain the custard into the half-and-half, stirring over the ice bath until cool. * Add the 1/4 cup bourbon, 1/4 teaspoon vanilla, and 1 1/2 teaspoon molasses. Stir till well mixed. Place in sealed container and refrigerate until thoroughly chilled. Overnight is best — it allows the flavors to really mix. Make sure your ice cream maker’s bowl is in the freezer so that it’s frozen by the next day. *Note: I skipped the ice bath because I didn’t have any ice, and it worked fine. Pull the caramel swirl out of the fridge and bring it to room temp. Put together the ice cream maker, turn it on, and pour in your ice cream custard. Freeze in the ice cream maker for 1/2 hour, at least, until it’s nearly doubled in volume and seems as frozen as it’ll get. It will still be soft — home made ice cream needs to go into the freezer for a few hours to really set. Working quickly, stir in the bacon bits while the ice cream is still in the frozen bowl. In a few smaller containers (I used margarine containers), put down a layer of ice cream. Add a layer of caramel swirl. Add another layer of ice cream, then another layer of caramel swirl, then another layer of ice cream. Put the lids on and place ice cream in freezer to finish freezing.